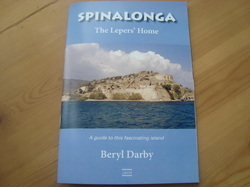 Thirty years ago my book “Spinalonga the Leper Island” was the first guide published about this small, rocky island which lies in the Bay of Mirabello, Crete. It was an immediate success and led to Melina Mercouri placing a preservation order on the island. Over the last three years I have received continual requests for copies of my guide and have been unable to satisfy bookshops and visitors to Elounda and Plaka as the publisher was no longer in business. Having branched out into self publishing with my novels, which are set in the area, I decided this was the answer for the guide book. The photographs have all been updated along with the text. The book still contains the history of the island, the latest medical facts regarding leprosy, describes the life of the sufferers who lived and died there, along with a description of the various buildings as you walk around the main road of the island, finally ending up at the graveyard.